"Do you think this Jesus could be the one?" Andrew asked Peter while casting the nets over the side of the boat, "I mean...do you think this one could be the messiah?" Peter was about to respond when Andrew saw Jesus standing on the shore nearby. Jesus waved to them and indicated that they should come in as he had something to say. Andrew looked to Peter and noticed that Peter was already taking in the nets and preparing the boat to return to land. When they got there, Jesus was smiling at them and asked them how they were doing with their fishing. They responded but they were waiting to see what this potential messiah might say to confirm or deny their hopeful suspicions. She remained active in protesting wars and acts of vast inattention and ignorance concerning the needy and outcast. She was investigated by the FBI and CIA as a spy and a revolutionary. Though her citizenship was truly in another Kingdom, she was not promoting insurrection anywhere except in the souls of the people whose hearts had been hardened to the cries of the needy. She was shot at, threatened, and assaulted because of her radical stance of peace and love as superior to vengeance and control. She actively resisted people who tried to insist that it was possible for her to do great things but impossible for them. In a very real way, Dorothy called everybody she met to live a life worthy of the Gospel and the cross of her Lord. Though she had rejected the Church as a youth because of its inattention to the poor, she spent the majority of her life (all the way until November 29, 1980) reforming the Church she loved to care for the people she loved. Herman could hardly believe what he was hearing and Herman was used to incredible stories. As a younger man in Russia he had experienced a terrible throat infection that was quickly rendering him mute. Day by day, his friends and family became increasingly uncomfortable with his voice devolving into series of croaks and sputters. He spent days in prayer for the health of his voice and throat but nothing seemed to happen. His family and friends prayed for him, as well. The thought of a monastic like Herman becoming mute was more than a little frightening--a learned man of prayer and words without a voice seemed especially tragic. Yet, it still seemed as if his prayers remained unanswered. As days passed, Herman's prayers became increasingly wordless and more and more desperate. One night he prayed before retiring for the night and felt an unmistakably odd sensation of hopeless desperation and faint, white-hot hope. Moving his lips in silence, he prayed: "Thy will be done." As he slept, a vision of the virgin Mary came to him and touched his ailing throat. A brief flash of pain and relief surged through him and he awoke with a start. "Was that a dream?" he asked himself aloud. In surprise, he heard his own voice and gratefulness flooded through his body. He had been miraculously healed. It was incredible--truly hard to believe. Yet, Herman could not believe that other men claiming the yoke of Christ would mistreat the Aleutian people so cruelly. They had arrived and insisted that they convert to their particular doctrinal position upon penalty of death. This was especially tragic for Herman since he had been sent as a missionary to Alaska from Russia to bring the Aleutian people the faith they were now being asked to suffer for. He had arrived with other missionaries to live and make room for a monastery among the Aleuts. They had been welcomed tentatively at first but had proven their love and compassion for the Aleuts and had become welcome dwellers in the often unforgiving wilds of Alaska. Regrettably, some of Herman's companions had gone back t o Russia for a variety of reasons. Others had been martyred. Herman had stayed and made himself a more permanent resident. He had experimented in the Alaskan soil and found a way to grow a garden. Now, only Herman remained as Orthodox monastic at the New Valaam monastery. His brothers and colleagues were now Aleutian converts. It was these men that were now in the grips of the others and facing martyrdom. It was one of these men who was telling him the incredible story. John LaFarge was a man with many questions who was willing to challenge the expectations and standards of most of the world. Yet, he was still a faithful member of the Roman Catholic church even as he asked questions and cultivated a life of investigation and consideration. For John, there was no tension between a life of faith and a life of intellectual and artistic pursuit. From an early age he had a passion for art and showed a natural talent and gift for it. He was encouraged to pursue a more reliable and lucrative career and so he considered becoming a lawyer for some time. Eventually, though, he came to a place in his life where he stood at a fork in the road: pursue the dependable and predictable or follow his calling and passion. John chose the right path and returned to the United States to study and produce art. As his advisers wondered aloud with each other how they could have been so blind, Maxentius fumed and gawked at what was going on. It was as if Catherine--who he now understood to be one of these Christians she defended--was contagious and her story was spreading quickly to those around her. Calling to his guards and hoping they hadn't been infected yet, he ordered the whole group--Catherine, his wife, and his advisers--arrested. They were thrown into prison and Maxentius hoped that this was enough to stop the spread of Catherine's faith. When people came to visit her they came away converted, however, and were imprisoned with them. When his cells were filling up he had the group brought before him again and had his own wife and advisers killed first while Catherine watched. Expecting that the crowd would shrink in fear and beg for their lives, he was surprised to see them laughing, clapping, and singing songs. It seemed that everything he did was playing into their hands. He had the rest of them killed--all except for Catherine. Catherine offered prayers of thanksgiving loudly with each cut of the blade and soon found herself condemned to die in a brutal, public and painful way-- the breaking wheel--because of her refusal to be broken before Maxentius' will. As they drug her to the public place, the crowd fell silent as they looked upon the condemned. She was marked for a gruesome death. The breaking wheel was a torturous way of dying that involved being tied to a wooden wheel with radial spokes. The soldiers would beat the condemned and apply pressure to the bones of the victim until they cracked and popped under the blows from the hammers. The gaps in the spokes allowed the bones to be broken in loud, agonizing, and mutilating fashion. Catherine seemed unfazed as they carried her to the wheel and the guards were frightened by her calm. When they laid her back on the wheel, the wheel broke as it came into contact with her skin. What resolve had remained now dissolved as they thought that surely this one was different from the others they had tortured and killed. The crowd murmured and to stem the possibility of yet another revival, Maxentius ordered her beheaded quickly before her contagion could spread to the crowd and guards. Columban was born in Nobber, Ireland--in the County of Meath--and grew into a competent and attractive young man. He was so attractive that women noticed him passing by through the towns and on the roads and began to seek him out. He became something of a local celebrity on account of his appearance and he was distressed by the steady decreases of his private life as more and more women sought him out to have him as their own. Columban received a piece of advice: flee from temptation so that you cannot succumb to it. In this advice, Columban saw hope and promise--he had always dreamed of becoming a monk and living a life of retreat and prayer and this path offered that opportunity. So, Columban decided to flee from the temptations of a hypersexualized existence and join a monastery. But, when he had packed his things and was headed to the door, his mother stopped him and begged him not to go. He insisted that he felt a call toward the monastic life but his mother refused to listen. She pleaded with him to stay again and again he insisted on following God's call. In desperation, Colulmban's mother laid down in the doorway to prevent her son from leaving. Columban struggled with what to do: should he concede to his mother's wishes or should he follow the call he felt on his life. He looked at his mother and made his decision. He stepped over his dear mother and left her behind to follow after the calling God had placed on his life. After some time as a monk and after he had become a noted speaker and counselor, he was appointed a missionary to a foreign land. The Roman empire had fallen only a few generations prior but the people of continental Europe still saw the outlying regions--such as Ireland--to be a barbarous place devoid of education or sense. The very idea of an Irish missionary to France was unthinkable to the French Christians--they were a people who sent missionaries not who received missionaries. Yet, this is where Columban and twelve others arrived. In France, they found a sickly and anemic Faith that subsisted on dead ritual and vague memories of spirituality. This was a mindbending experience for the Irish missionaries who knew that the Irish had received their faith from the world they now ministered to. They were bringing the faith that had been brought to them back to the ones who had sent it. They were met with a mixture of resistance and open arms. Many found the Irish spirituality to be an oasis in a dry and dusty land. 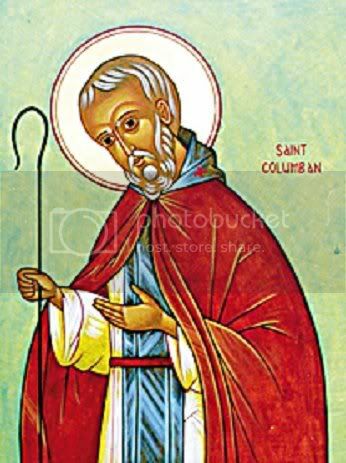 There were many who ended up being guided by Columban to follow in the footsteps of Patrick who had been one of them (having been born in Roman Britain) but had gone to provide sustenance to the Irish who had enslaved him. In essence, Columban brought back spiritual sustenance to a people who had forgotten that they had stored it away in Ireland. Eventually, they were met with resistance from local rulers and became enemies of the King of Burgundy. It seems that the Frankish bishops and leaders were uncomfortably with the Irish being in a seat of authority. They held on to their memories and nostalgia instead of drinking deeply from the cool waters Columban brought with him. 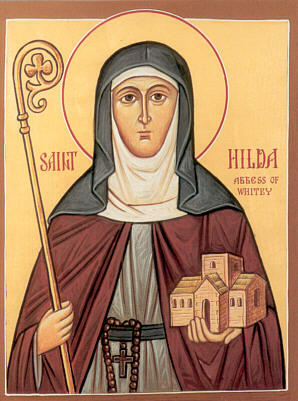 They were forced to flee from their monastery and became voluntary refugees who lived by charity and good fortune. Eventually, they walked across the Alps to Milan and were received gladly. Columban would spend the remainder of his days far away from the formative places of his childhood in Ireland and in a land that God had called him to--regardless of the cost. As he knelt on the beach by the Black Sea, Clement recalled the time he spent working with Paul. Clement had been born in Philippi and had worked with Paul when Paul came through. In fact, Clement had been one of the people who Paul mentioned in his letter to the Philippians. Perhaps Clement had been one of the young men who told the story of Paul's conversion in hushed tones of awe. He hadn't stayed in Philippi for his entire life, of course, but his interaction with Paul and Paul's interaction with him had left a powerful mark on young Clement. Years later, after Paul had been executed and the Philippian congregation had undergone yet even more persecution, Clement was bishop in Rome and in charge of helping and guiding the house churches and congregations in Rome. They picked up the anchor and dropped it into the water. Clement was helpless to follow. He died a martyr. C.S. Lewis was born in Belfast, Ireland in 1898 to a middle class family doing what they could to get by. He had an older brother and a dog named Jacksie. When Lewis was only four years old Jacksie was hit by a car. In only a few days, the understandably and clearly disturbed Lewis insisted to his family that they call him Jacksie. His family resisted little Clive's insistences because of how ridiculous it would sound to call their son after the name of the dead dog. Yet, Clive refused to answer to any other name and would go long stretches of time in silence as his parents called to him by the name "Clive." Perhaps to humor him, they compromised and started calling him Jack. As is the way of things, the nickname stuck and soon everybody was calling him Jack by habit. It was only after receiving his education at Oxford and becoming a professor, he began having regular conversations with J.R.R. Tolkien and a few other friends at the university. When they made overtures about the Christian faith he brushed them away by insisting that he was an atheist and had no desire to think of the Christian God he had never experienced. They were persistent in their kind conversations and he trusted them as friends--even if he refused them--but he still responded with the words of Lucretius: "Had God designed the world, it would not be a world so frail and faulty as we see." Despite his rejections, his Christian friends continued to love him and socialize with him. He was not simply the target of their evangelistic machinery. Rather, he was their friend and because of their deep love, they could not help but mention the Faith that had changed their lives. Eventually, the persistent God that led Tolkien got ahold of Jack. Jack insisted that he came "kicking and screaming" into the Faith and later wrote about that night: "You must picture me alone in that room in Magdalen, night after night, feeling, whenever my mind lifted even for a second from my work, the steady, unrelenting approach of Him whom I so earnestly desired not to meet. That which I greatly feared had at last come upon me. In the Trinity Term of 1929 I gave in, and admitted that God was God, and knelt and prayed: perhaps, that night, the most dejected and reluctant convert in all England." At the age of thirty-five, Jack found a home in t he Faith. At first he only admitted theism but it was not long before he was won over to Christianity. Lewis' conversion is a story told by many Christians to this day because of the nature of it as the pursuit of a man by an unrelenting and loving God. Jack's life had its share of suffering--from the abuses suffered as a child in boarding schools and his service and wounding in the British army during World War I to the death of his beloved wife (inspiration for perhaps his most beautifully personal book--A Grief Observed) and his own suffering with renal failure at the end. In spite of this suffering and pain, Lewis was never again persuaded to reject the God that had so eagerly pursued him. He wrote many books and articles that have been an inspiration to countless Christians for many years [note: my personal favorite is The Great Divorce]. Jack's life was a life defined by flight and chase. He fled from the God he so desperately wanted. As he did, he looked over his shoulder to make sure God would follow. Eventually, he was caught once again by the God of his mother, father, and childhood. Miguel had spent many years among the mining towns of Mexico. Born the son of a miner and his wife in Guadalupe, Zacatecas, he didn't experience the same kind of affluent lifestyle of some other saints. Rather, Miguel was born on the poverty line and was one of eleven children. As one of the elder children, he helped take care of his siblings. The Mexican people were Miguel's passion even as a child and he studied so that he might become a priest and serve them. Of particular interest to Miguel were people with similar humble beginnings who struggled to survive in a world that was rarely suited for their success and health. Throughout his life, Miguel was a man of prayer--often saying that the only thing that truly kept him going was prayer. At the age of 20, he began his studies with the Jesuits so that he might offer himself to the clerical life among the people of Mexico. Regrettably, however, he could not stay in Mexico long after this time. In Belgium he was ordained to the priestly ministry. His life was even more prayer filled after his ordination and after a short time in Belgium, it became clear that his deteriorating health was partially due to his discomfort with the climate and his homesickness for the people of Mexico. Against the better judgment of some of his superiors, he was sent back to Mexico. Miguel prayerfully thanked those over him and went gladly. His life in Mexico included priestly duties held in secret. He was overjoyed to visit and pray with the people entrusted to him and broke bread in many homes under the cover of darkness and the confident peace of prayer. When the ruler of Mexico--Plutarco Elias Calles--was nearly assassinated, he took a chance to put a stop to Miguel's work. He insisted that the planning had been the work of Miguel and had him arrested. There was a short--and ludicrous--trial but eventually Plutarco simply decreed that Miguel be executed. The pretext for the execution was an attempted assassination but the real reason was the constantly grasping desire of the State to subvert and excise the Church in Mexico. Miguel was drug from his cell in the early morning and granted one last request: to be allowed to kneel and pray (see above picture). They took him to the firing range and secured him so that he might present a target for the rifles. They did not secure his arms and so he offered a blessing and prayer over the men holding the rifles that would soon bring his death. He declined the blindfold offered to him,--he was not afraid to look upon the State's atrocities-- grasped his crucifix in one hand and his rosary in the other and offered a loud shout proclaiming his desire to forgive the ones who now held his earthly life in their hands. "Ready," yelled the commander and Miguel offered a sweet smile as the men raised their rifles. "Aim," continued the commander and Miguel stretched his arms out as if he were being crucified (see picture). The firing squad directed their rifles at his heart now exposed in his cruciform posture. "Fire!" yelled the commander. The men shot and hit Miguel who crumpled to the ground. He was not dead but he was dying. As the commander approached the bleeding body of Miguel, Miguel cried out: "Viva Cristo Rey!" or "Long live Christ the King!" The commander drew his sidearm and shot Miguel in the head at pointblank range. It was Shubal's desire to awaken true discipleship in the minds and lives of the people he came into contact with. In many ways, Shubal hoped to bring Jesus to people who already claimed to know him. In many ways, he succeeded. In just a little while the 16 members of the church became 606. Soon, the congregation was founding and spreading yet more churches into the world. When Shubal finally died, there were 125 ministers who named Shubal as their minister and mentor. There were 42 churches that had been started by Shubal and his people. Following in the model of the early Church, the congregations that Shubal founded constantly grew and birthed other congregations. Shubal was not known for theological brilliance or homiletical sophistication. Rather, he was known for simply and powerfully proclaiming the Gospel in a way that left the listener with little room to retreat into themselves. He had a bright and brilliant passion for the Church that he served and loved. When he passed on, he was well remembered as a joyful servant of the Body of Christ in the middle of geographical and social obscurity. He may not have had a huge impact on polite society but he had a life changing impact on the people who sat rapturously under his preaching. 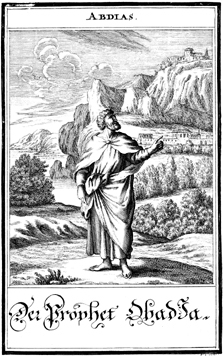 Worship of Baal was widespread through Israel yet Obadiah continued to worship the one God of Israel. The only major difference now was that he had to do it in secret most of the time. Obadiah had hidden prophets in caves so that Jezebel might not find them and slaughter them. He had split the groups into two small er groups so that they could be hidden in separate caves. This way, if one cave was discovered and raided, the prophets in the other cave could escape quickly and some of them might be saved from Jezebel's bloody hands. Eventually, Ahab and Jezebel grew tired of the prophet Elijah who resisted them and seemed untouchable. They gathered up three detachments of soldiers and sent them out to arrest Elijah and bring him back to answer their questions. Obadiah was one of the soldier leaders who led the third detachment of soldiers. The three groups went off to do the dirty work of the idolatrous rulers and seize God's prophet. As the first detachment approached Elijah, they noticed that he did not seem prepared to resist them. Instead, they found him kneeling and wordlessly moving his lips in prayer. As they approached--calling out to him loudly with mockery in their voices--fire consumed them as if it had fallen from the sky. With more hesitation, the second detachment continued their advance on Elijah and soon fell to the same fate of incineration. As Obadiah's detachment approached, Obadiah offered his own prayers and was surprised to see that the same fate did not befall the frightened group of soldiers. "All of you have been spared," shouted Elijah as he pointed at Obadiah, "because of this man's devotion to the one true God of Israel." Obadiah and Elijah shared the Faith with the soldiers and as they were preparing to return to Ahab and Jezebel empty handed they were surprised to see that Obadiah was removing his weapons and armor. "Take these back with you and give them to Ahab and Jezebel," he said, "I shall serve them no longer." They did as he requested and Obadiah stayed with Elijah to learn more about the life of a prophet. He felt a strong calling to speak truth in a powerful way regardless of cost or threat. He became a prophet to Edom and prophesied of a coming day of judgment for all nations. Before he died, or perhaps shortly thereafter, some of his words were recorded. It was Obadiah who said, "For the day of the LORD is near upon all the nations. As you have done, it shall be done to you; your deeds shall return on your own head." The man who had remained faithful even in the face of great threat and danger called all people to remember God's justice and judgment even before it became so powerfully apparent. Henry II was still doing penance for the murder of Thomas Becket. As part of his penance, he was ordered to establish a Carthusian monastery in England but it had experienced quite a bit of trouble in getting started. The first prior had retired without building the monastery and the second had recently died. Henry knew that he was expected to find a prior who would establish and strengthen the group so he sent a group to go and bring Hugh to England to lead this group of unorganized monks. Hugh and the Carthusians knew that this was a dangerous thing--to go to the country that had murdered Thomas and lead a monastic movement--but it was agreed that Hugh could do great work for the Kingdom so Hugh went willingly with a touch of anxiety. Eventually, Hugh was elected bishop of Lincoln by the king and the king's people. He thanked the king but refused to accept it until he could meet with his colleague and they could vote. Hugh wasn't keen on allowing a king to command the affairs of the Church. Hugh's colleagues agreed and Hugh became bishop of Lincoln. As bishop, he was not afraid of the king, however. He remained convinced that the king had no room to command or dictate Church policy and did not hesitate to exact Church discipline upon errant members who were connected to the king. Their relation to the king of England did not absolve them from their sins, he insisted. He resisted the king's appointments to ecclesial positions and even refused some of the king's direct orders. All of this was done in a culture that keenly remembered the martyrdom of Thomas Becket. Hugh had no fear, however. Further crusading against the culture, Hugh was known to condemn violence against the Jewish people of Lincoln and England. The Jewish people soon learned that they were safe with Hugh. Ludwig died only seven years into his marriage with Elisabeth. He died while traveling to participate in war. His remains were returned to his widow and a funeral was held. Then, twenty-one-year-old Elisabeth was put into the care her confessor Konrad. This was not a good day in the life of Elisabeth. She was restrained from practicing her radical charity. She was punished severely for lapses in character no matter how small. Konrad ordered her to be physically beaten for some sins yet was also keen to stop her from going forth and practicing the faith she had learned from the Franciscans. Konrad--who would one day become an inquisitor--stopped her one day to look in the basket she was carrying. Elisabeth was frightened by the surprise inspection and knew that Konrad would be displeased by the loaves of bread she was secreting from the residence to the poor. When he opened the basket, however, miraculously he found only roses. Shaking his head in confusion, he allowed her to leave and when she arrived among the poor, the loaves were bread again and she distributed them to the people. Instead, a story was suggested to him where he was a revolutionary and a spy for Western Imperial powers. He insisted that this was a lie but the trial was never about finding out the truth and so it continued on as if he had said nothing or perhaps agreed with them. They paraded out evidence of guns and incriminating artifacts and papers. All of these items pointed even more strongly at the story that said Eugene was an insurrectionist and criminal. Of course, the guns were returned to the museum that they had been lifted from at the end of the day and nobody really cared much for the evidence--after all, they had already agreed on a verdict and sentence. What nobody bothered to find out was how he had been born Vincent Bossilkov in Bulgaria and had pursued a calling as a Passionist monk. Nobody bothered to consider how joyous he had felt when he was ordained in 1926 and how his passion was to bring life and light to the Bulgarian people. 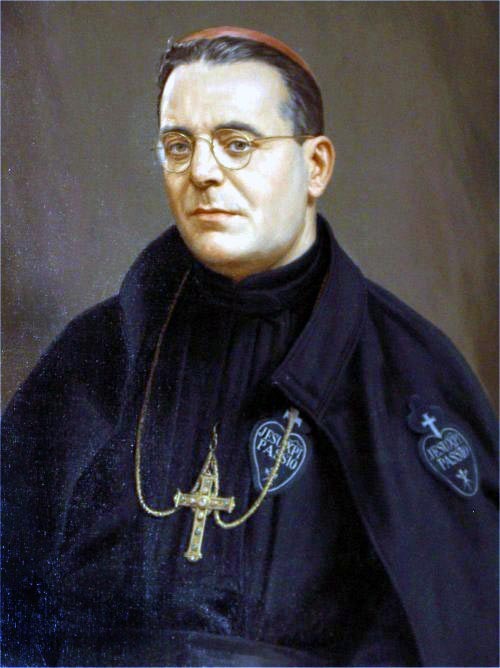 They noticed that he had spent time studying in Rome and insisted that he had been trained to combat communism but they failed to point out that his personal passion had been taking care of the laity within the diocese he returned to. He had opportunities to exercise power and influence but was more interested in caring for the flock. Further, Eugene had not fled the Soviet conquest of Bulgaria after World War II and had, instead, remained to take care of those who were left behind. While the Soviets began implementing laws and directives designed to curtail, hinder, and eventually eliminate religion in Bulgaria Eugene was appointed Bishop. It was this appointment that hastened his arrest, trial, and death sentence. She brought the beggars and homeless into the dining room and sat them at her own lavishly appointed table. Each of them must have gasped in awe of the beautiful settings and luxurious furniture. She sat the first of them down in a chair worth more than all his possessions and brought a bowl of water and towel out from underneath it. Without a word, she lifted his foot and washed it with the water and the towel. On her knees before a beggar, the queen offered love in a wordless and powerful way. One by one, she washed the feet of each of her beloved and esteemed guests. The beggar barely had enough clothing to cover his nakedness. He looked weak from hunger and exhaustion. Most people in the crowd passed over him quickly because he made them uncomfortable. He was "somebody-else's-problem" and they felt he probably had more problems than they could count or determine. They salved over their discomfort with rationalizations that allowed them to avoid this destitute beggar in mind and sight. Yet, Martin couldn't look away. His heart burned at the sight of the nakedness of the man and he wondered if there wasn't something he could do. He was astounded at the way people ignored and avoided the man and wondered if it wasn't possible that he was seeing things since it seemed that this man was invisible to the crowd. The words of his Christian friends echoed in his mind and he was moved to help. He dismounted his horse, drew his sword and cut his cloak in half. He gave half of the split cloak to the man. The man accepted it wordlessly but with a smile. Not knowing what else to do, Martin mounted the horse and rode off wondering what he had just done.